Jeep's Grand Commander made its debut on Wednesday at the 2018 Beijing auto show. The three-row crossover SUV has been developed exclusively for the Chinese market so won't be sold in the United States. The low approach and departure angles belie Jeep’s off-road credentials, which is probably why. The Grand Commander was previewed by the plug-in hybrid Jeep Yuntu concept presented at the 2017 Shanghai auto show, however it doesn't feature an electrified option just yet. Instead the Grand Commander debuts with a 2.0-liter turbocharged inline-4 delivering 230 horsepower and 258 pound-feet of torque. Drive is sent to either the front wheels or all four via a nine-speed automatic transmission. Underpinning the vehicle is a stretched version of Fiat Chrysler Automobiles’ Compact U.S. Wide (CUSW) platform, which is also found in the Cherokee. 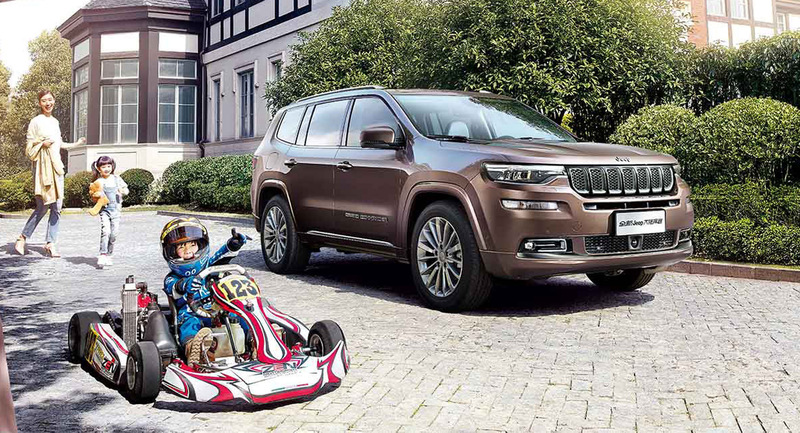 The Grand Commander has a total length of 191.85 inches and a wheelbase of 110 inches, making it substantially larger than the Cherokee whose comparable measurements come in at 182 inches and 106.3 inches, respectively. Production will be handled at a plant in China operated by Jeep and its local partner GAC. Jeep has a different pair of three-row SUVs planned for the U.S. The automaker is working on a Wagoneer and super-sized Grand Wagoneer for sale here. They will be based on the body-on-frame platform of the latest Ram 1500 and enter production at FCA's Warren Truck Assembly plant in Michigan some time after 2020.